World Champion Drifter Vaughn Gittin Jr. and Mustang RTR teamed up with Need for Speed to build this one-of-a-kind, fully-functional Street, Track and Drift machine. Balancing 5.0 liters of tire-shredding American horsepower with vintage American, Japanese, European and Drift culture inspired design influences, Vaughn has incorporated state-of-the-art technology while retaining a nostalgic feel into his vision for the 69’ Ford Mustang’s timeless body. The RTR-X was designed and built from the ground up to be driven hard; the RTR-X is NOT a trailer queen. While Vaughn will be the only one behind the wheel thrashing it, the entire world will be able to enjoy driving the HPI 1/10th scale RTR-X. The Sprint 2 Sport RTR is now better than ever! We’ve taken the proven Sprint 2 platform and added a 2.4GHz radio system, pre-painted bodies, waterproof electronics, LIPO-capable electronic speed control, 7.2V battery pack with AC wall charger, AA batteries for the transmitter, and orange anodized chassis parts. And it’s all pre-built to precise factory specs to get you driving quickly. Controlling the Sprint 2 Sport RTR is easy with the HPI TF-40 2.4GHz radio system. No need to worry about changing crystals, the radio prevents frequency conflicts automatically. The TF-40 pistol grip transmitter features adjustments for steering trim, throttle trim, steering dual rate, end points, servo reversing switches, low battery indicator and a 3rd channel for optional accessories. The 3 channel receiver is equipped with a failsafe system for maximum safety. The Sprint 2 Sport RTR now has a waterproof receiver box to keep the 2.4GHz receiver protected from the elements for glitch-free operation. A new SF-10W waterproof steering servo and a waterproof SC-15WP speed control mean your Sprint 2 Sport RTR won’t be stopped by wet conditions. To help get your new Sprint 2 Sport RTR running as quickly as possible, a rechargeable 7.2V Plazma 2000mAh battery pack and AC wall charger are now included, along with Plazma AA’s for your transmitter. Just charge the battery and you’re ready to start driving! 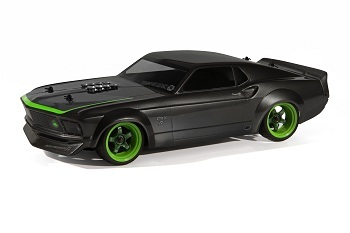 The 1969 Ford Mustang RTR-X Sprint 2 Sport features a highly detailed replica 1969 Ford Mustang RTR-X body finished in gunmetal metallic paint. Two sets of Work Meister S1 wheels are included, one set for Drift with pre-mounted HPI T-Drifts and another set for Grip with pre-mounted HPI X-Patterns! The body comes completely trimmed, decaled and mounted. The finished kit perfectly captures the essence of the RTR-X in 1/10th scale with it’s timeless looks and awesome performance.You can also customize the Sprint 2 Sport chassis with any of the clear or pre-painted polycarbonate body shells from the huge assortment of HPI bodies and option wheels/tires! The Sprint 2 Sport RTR takes full advantage of all of the benefits of electric power; it’s quiet, clean, powerful and truly plug-and-play… no starter or fuel needed! Power comes from a Firebolt 15T motor, controlled by an electronic speed control for complete control over throttle, brakes, and reverse. 6 and 7 cell NiMh battery packs fit easily in the Sprint 2 Sport RTR, as well as 2S Li-Po packs. From authentic looks to full adjustability of the suspension geometry, the Sprint 2 Sport RTR is the complete package. 2.4GHz radio, full ball bearings, waterproof electronics and silicone oil-filled shocks – it’s all there on the Sprint 2 Sport RTR, precision built from the factory. Drift and Grip sets of pre mounted wheels and tires included!